When the shroud of night falls, the only light source keeping your wristwatch legible is the humble glow of overhanging streetlights. However, what do you do when you find yourself in the absence of these trusty (sometimes defunct) beacons? Surely whipping out your smartphone will do the trick, but that defeats the entire purpose of wearing a stylish mechanical timekeeper. Instead, swap them out with these brilliantly illuminated watches in order to feed your inner horologist even in the dark. 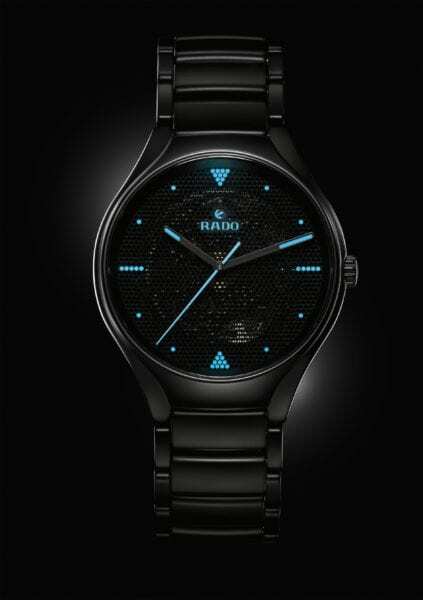 The minimalistic True Phospho by Rado and Big-Game design studio starts off our luminous list. At first glance, the simple-looking watch seems innocuous, but further inspection reveals a perforated black brass dial that allows the Swiss automatic movement to shine through – an unconventional but wonderful interpretation of the traditional skeleton watch. Light from the luminescent indexes tipped with Superluminova seeps through the cracks, while the second hand also shimmers in the dark with the glow-in-the-dark substance. 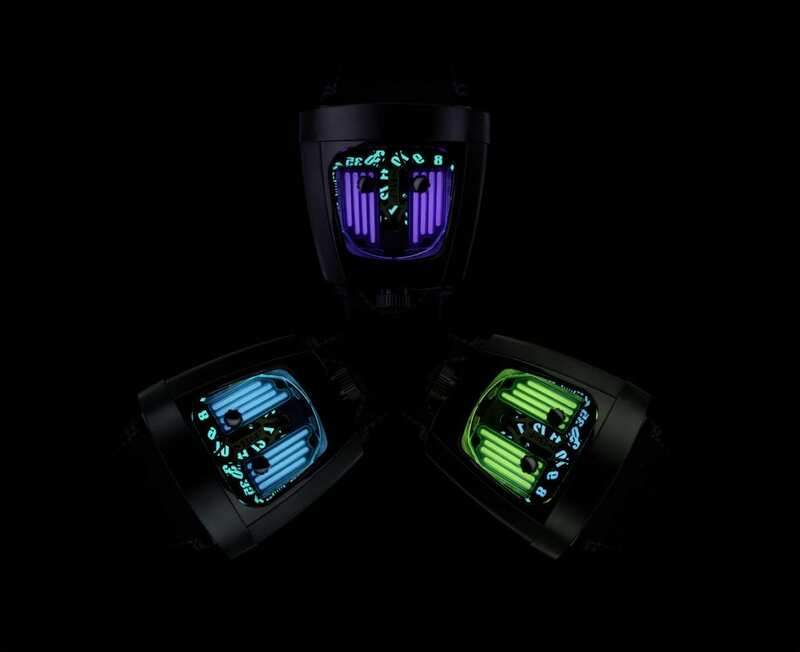 Fuelled by a rebellious passion, Black Badger founder James Thompson turned to luminescent materials to express his pent-up creativity. 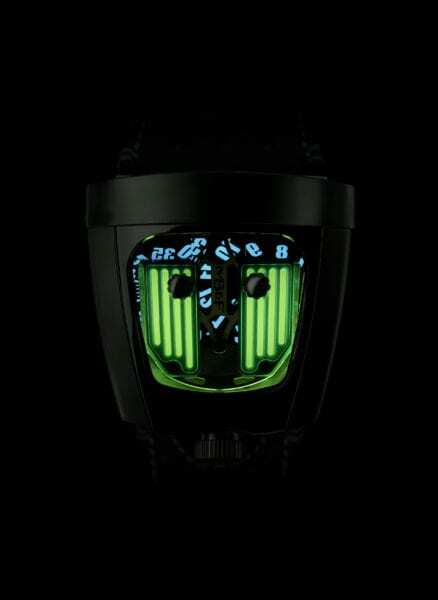 Cue the HMX Black Badger, in collaboration with maverick watchmaker MB&F. Underneath a supercar-like structure with sapphire crystal hood lies a redesigned HMX engine, milled from blocks of brightly coloured, high-efficiency lume. 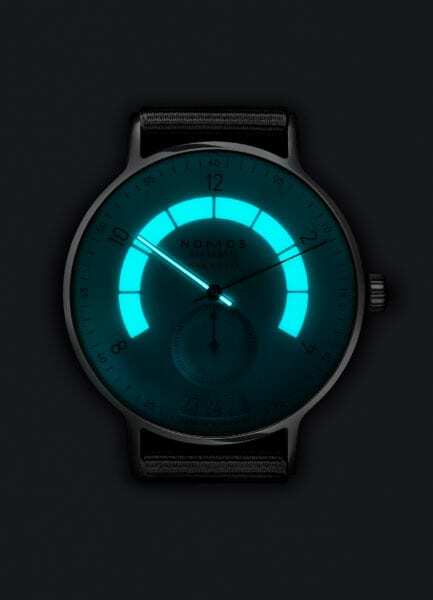 When the lights dim, the eye-catching colours come out to play, as neon green, blue and purple provide colourful backlights to the time display. Borrowing a look uncannily similar to the cult classic Tron flicks, the Nomos Glashütte Autobahn gleams in bright neon blue even in the darkest of futuristic dystopias. Inspired by kinetic movement, the 41mm watch is powered by the highly complex Neomatik calibre. An elongated date window displays three days at once – yesterday, today, and tomorrow – but it is the watch’s luminous ring of Superluminova-coated bars that sits above it that makes it a must-have for night-dwellers. As discussed before, watchmakers are no strangers to working with precious metals outside the usual spectrum of solid golds and si ..